I've only recently joined, but been following for some time. Figured I'd share my favorite of the Tokai's I have. It's an 81 ES-150J. 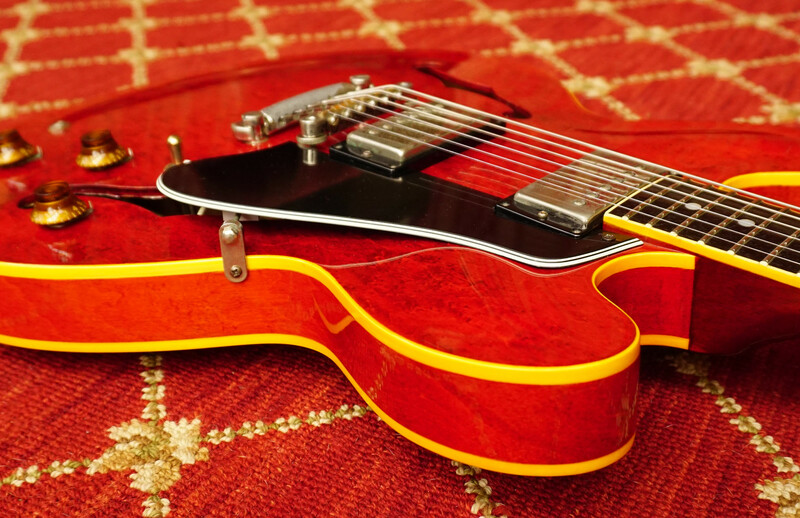 ES-150 and ES-100 were new models in 1981 and each came in Rock and Jazz versions. Mine is a Jazz version, which means it has the Jazz, rather than Rock pickups. The 100 and 150 are very much the same guitars, with the differences being the 150 has birds eye maple, a cashew lacquer finish (love the amber tone to it), ebony fretboard and upgraded electronics including oil condensers. On both guitars Tokai used 3-ply maple (all three ply's are maple), single piece mahogany neck, MOP dots on the fretboard, same neck profile as used on 59 and 60 335's, 5-ply long pickguard, and solid maple center block sandwiched between spruce. 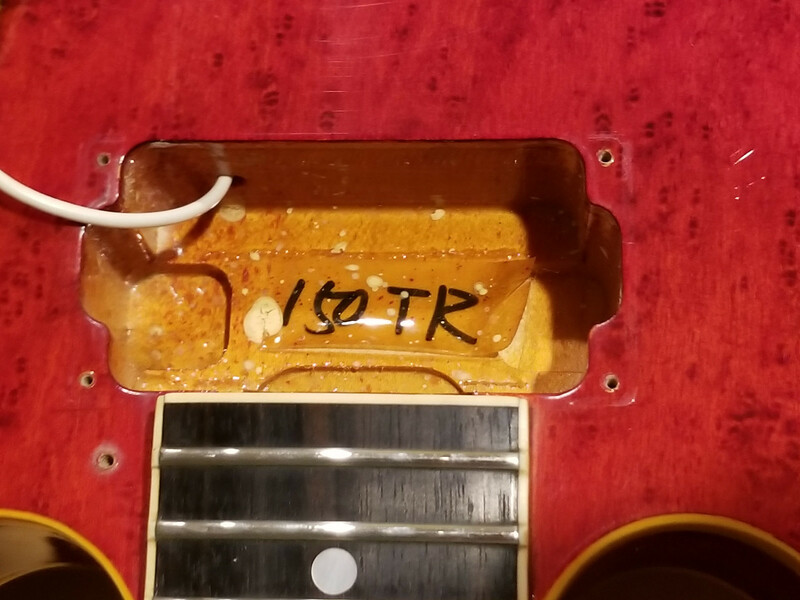 Tokai’s catalog says they did exhaustive research into the details of ’58 to ’64 ES-335’s and all those details are just how the originals were made. I’m really into vintage MIJ copies of ES-335’s and trying to document many of them more fully as the details on them aren’t nearly as well known as the Les Paul copies. And if you are wondering, yes, the guitar plays and sounds fantastic. "The whole series comes in black sunburst (SB), Tokai red (TR) or natural (N), with classic lacquer finish on the ES100 R and ES100J or cashew nut finish on the ES150R and ES150J"
Shows the same in the specifications grid. ah thats very interesting... i was always under the impression it was nitro!! 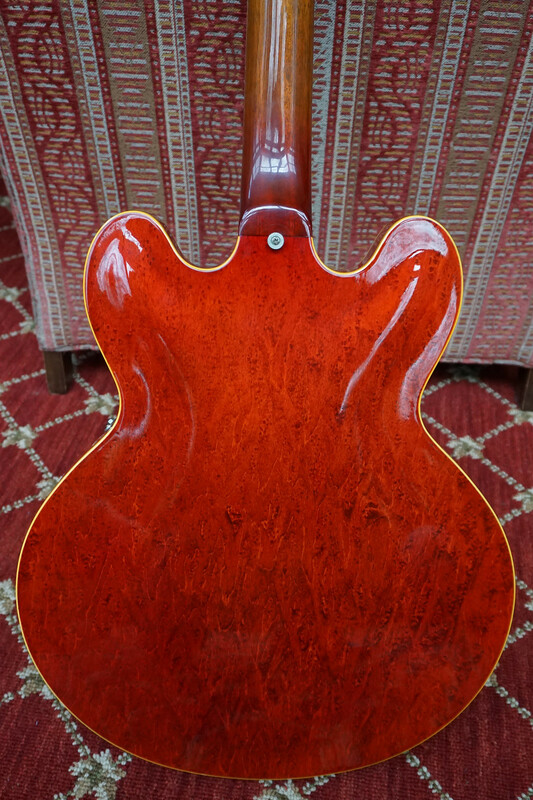 cool..
what is the neck thickness like at the first fret? The top on it is very nice - a lot of figure in the wood and plays to the light. Thing that is really confusing is trying to understand what cashew lacquer is - made from cashew nuts. "The construction of the neck grip remains absolutely faithful to the production cut on guitars made in ‘59 and ‘60—we can promise that musicians who know will recognize the difference. " When cashew nut finish is used you can ID it on yellowish body and neck binding. 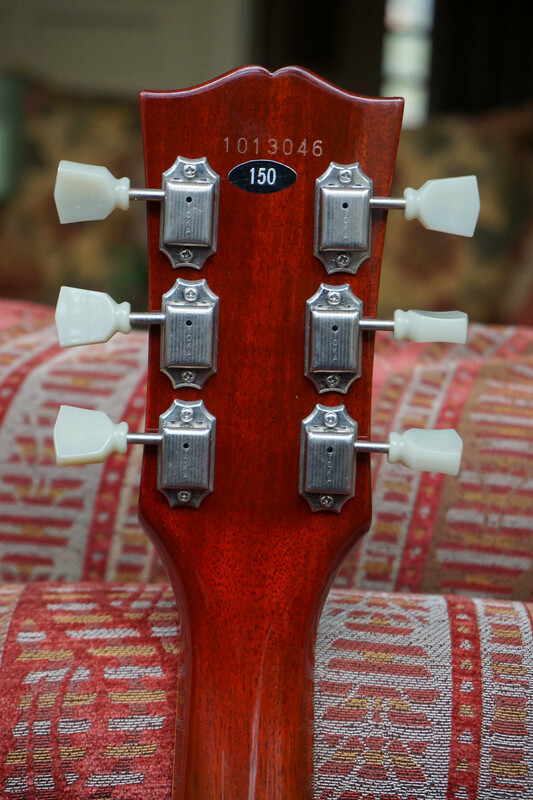 I was thinking these (earlier) Tokai ES examples likely have a 'smallish' neck profile. I have owned several 2000 & later Tokai ES examples but I eventually sold them all because of the smaller necks. .840" is actually smaller 1st fret thickness than any (Gibson) style guitar I have. .875" to .900" 1st fret thickness seems to be a good area for my preference. 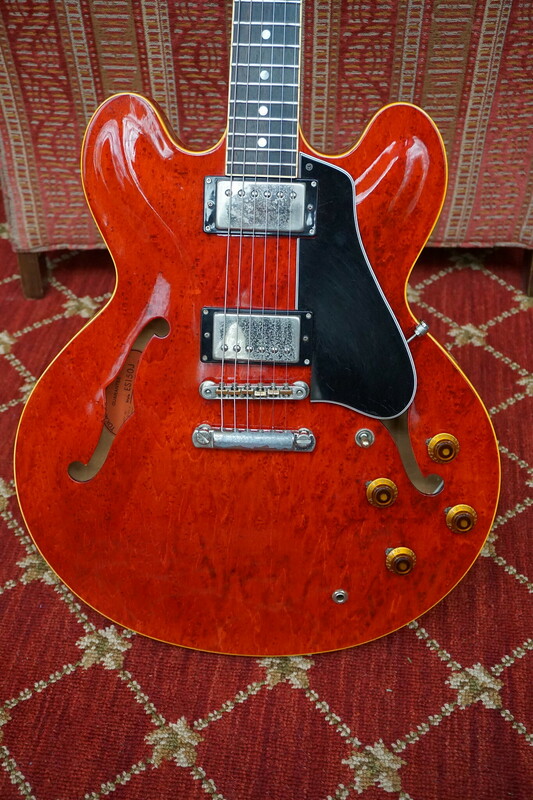 Would love to locate an early Tokai ES with a larger neck but I don't believe Tokai ever made any that fit that description, at least from what I have heard from owners/players. I had 3, still have 2 and they all differ in neck thickness.. the sunburst one had a really thick neck, similiar to my gibson es-175 vos. The natural one and cherry have a thinner neck. 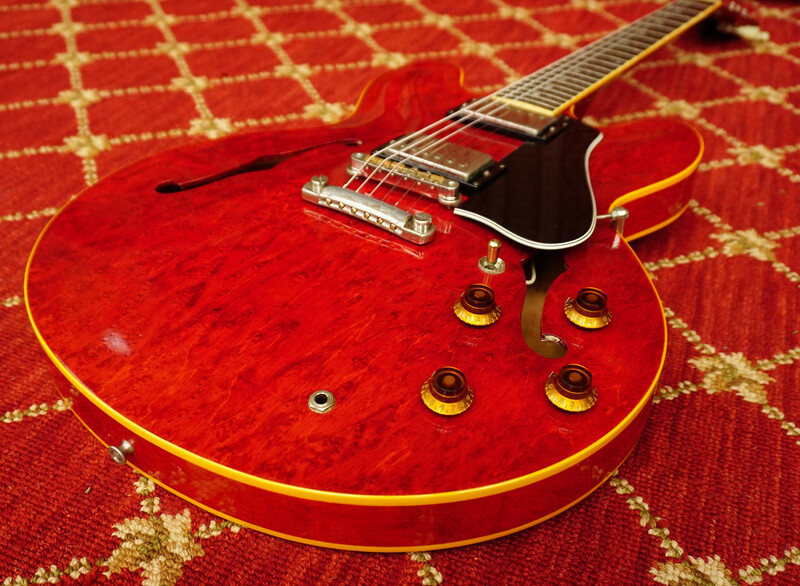 lovely es-150! The binding on those is always more yellow then on the es-100's. Definitely different lacquer. They are my favorite tokai's as well. I will check my ES100 SB 1981 finally restored back to stock and with Antiquities, TVT pots and Sprague Hyrel (PIO military 50s) caps. A friend of mine has a '81 ES100 that is just three serial numbers apart from my '81 ES100. His has a noticable thicker neck and soundwise a little bit more low end, other than that they are identical. Fantastic guitars!